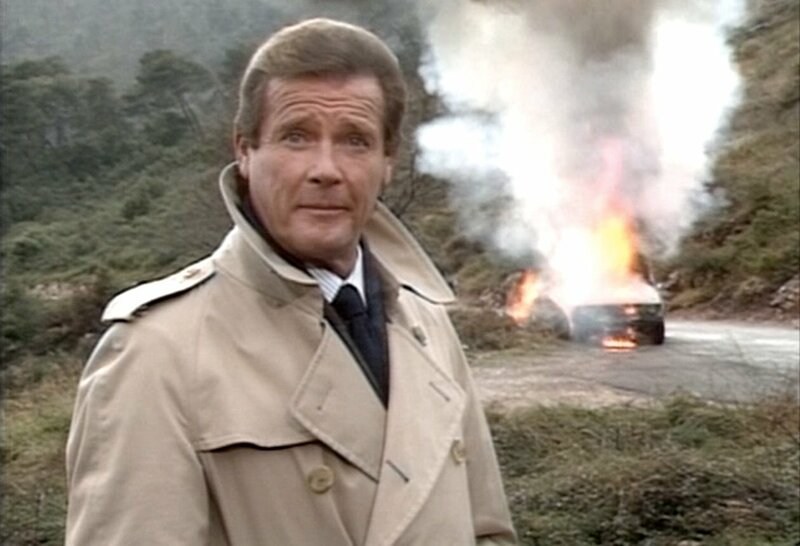 Though Roger Moore only carries a trench coat as James Bond in For Your Eyes Only, in the 1987 James Bond retrospective Happy Anniversary 007 he properly wears a trench coat. Moore wears many trench coats thought his films and television shows, and this is the second one in Happy Anniversary 007. The first is made of corduroy, whilst this one is made of tan cotton gabardine. It’s a classic trench coat: full length below the knee with raglan sleeves. It is double-breasted with ten buttons and has shoulder straps, a yoke across the upper back, a storm flap on the front right, and a self belt and wrist straps that close with a leather buckles. Moore keeps his hands warm inside the slash pockets and wears a heavy grey scarf draped around his neck underneath the coat. 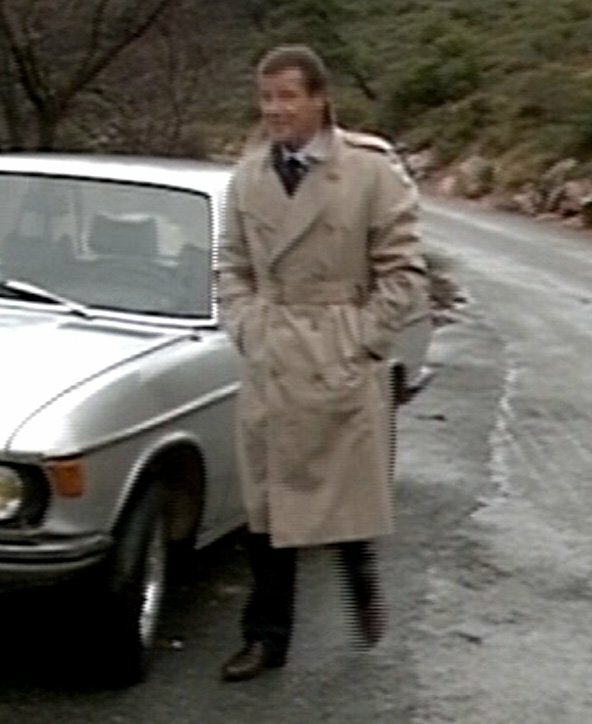 Underneath the trench coat Moore wears what appears to be a navy suit, of which here we can only see the bottoms of the trousers. His blue and white striped shirt has a spread collar and 1-button rounded cuffs. Though we don’t see enough of the shirt to be able to tell if it’s one of his Frank Foster shirts, the spread collar already makes it a nicer shirt than the point-collar shirt he wears earlier with a navy blazer. We also don’t get to see much of the navy tie, but it has a slightly chunky texture that might suggest a knitted wool or cashmere tie. As Bond, Moore follows English tradition and always wears black shoes with his navy suits, but here he follows the continental and American practice of wearing dark brown slip-ons with navy. Back to the navy suit that Moore wears under the trench coat, it’s probably the same navy suit that Moore wears at the beginning of Happy Anniversary 007. This suit is a typical Douglas Hayward single-breasted suit with natural shoulders—which were very out of fashion by 1987—and probably two buttons. He wears it with a pale blue shirt that has a moderate spread collar with edge stitching and rounded 1-button cuffs. 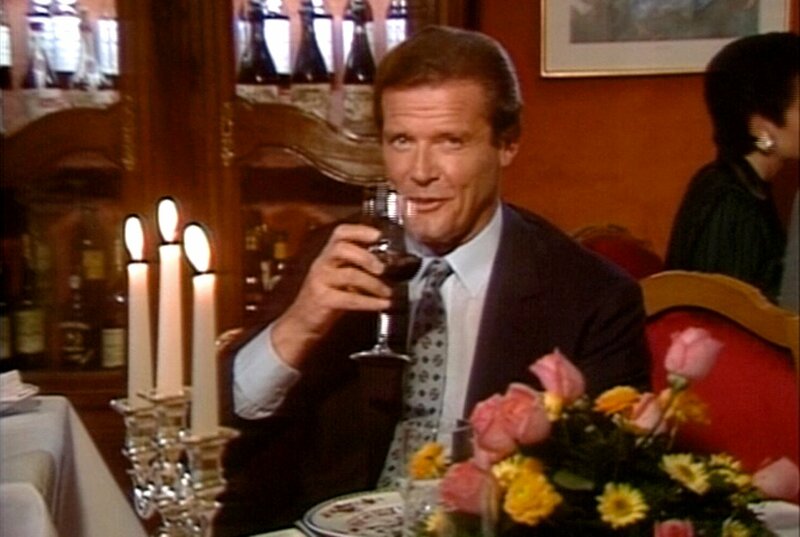 It’s not a Frank Foster shirt, but it is almost certainly high street ready-to-wear of a lower quality than we’ve come to expect from both Roger Moore and James Bond. His grey tie with black printed figures is tied in a four-in-hand knot. It would appear his pocket square matches the tie. 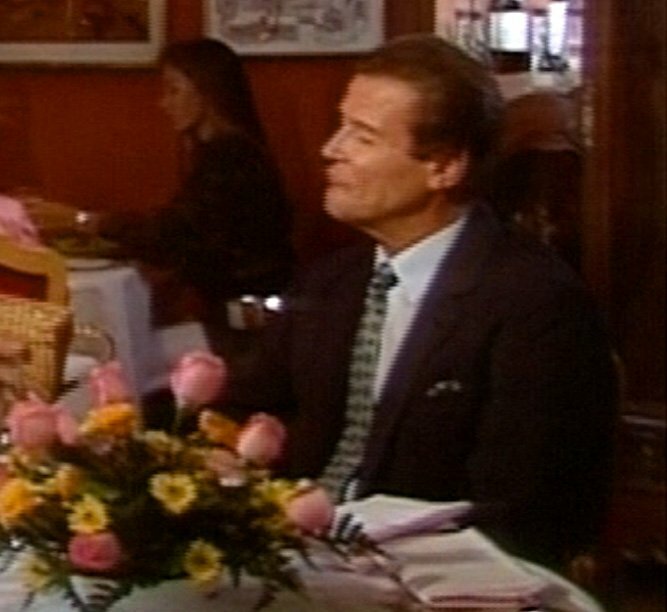 Matching the tie and pocket square is an unstylish faux pas, but it’s a rare moment that Roger Moore wears something in his breast pocket. As you say, Matt, the fact that Moore wore trench coats so often in his film and TV work it does seem a pity that he never wore one as Bond. It’s such a classic, British garment that it would certainly have sat with his portrayal of the character. This particular example is more than likely by a long time specialist in upmarket British rain coats, such as Burberry or Aquascutum. I have an Aquascutum version which looks exactly like this (the buttons seem identical) and, given the washout winter we are currently experiencing in Western Europe, it’s sure getting plenty of wear! The Hayward suit with its natural shoulder wouldn’t have been, as you say, the height of fashion by 1987, but it’s a hell of a lot more appealing and again, classic, than the excessively wide shoulder variety that were in vogue then. Once again a vindication of those of us laud who Moore and his sartorial taste! Still, don’t understand the inferior shirts here though?? I’m not sure Bond would ever wear one of these. It’s just a bit too closely associated with the clichéd 1940’s gumshoe detective. A fedora and a cigarette and he’d be eyed up as a potential spy a mile away. Dan, I’m not sure I agree. If it were raining, for instance, there would be nothing cliche about Bond choosing to wear a trench coat. I could easily envision Daniel Craig’s current Bond wearing one in navy, which I think would look quite good. Well, he wore a navy single-breasted rain coat in Casino Royale. By the way, do you intend to cover it ? Matt, speaking of CR…is there any chance you could review the ensemble Daniel Craig wore at the CR press conference?? It was a personal favorite of mine, and I’m dissapointed it didn’t make it into the final film. Yes, I’ve already started on it. I actually forgot about that coat, although it must’ve stayed in my sub-conscious. I look forward to seeing it again when you cover it. A single breasted Mackintosh seems a lot more in keeping with the Bond aesthetic, though to be fair a lot of the minimalist look has been bent or broken over time with the various Bonds. I suspect a lot of what we se throughout this documentary are things picked from Sir Rogers personal wardrobe. As for the shirts – remember that he lived in Beverly Hills back in 1987, hardly the capital of well tailored clothing. That’s fair enough, VPB, but, from everything I’ve ever read and seen of Roger Moore, up until recently at any rate, Frank Foster and Doug Hayward were both his shirt maker and tailor of choice respectively. From his public appearances it was obvious to even someone with my half trained eye that all his clothing came from same so it’s just rather odd and jarring that these bargain basement shirts entered his wardrobe on this occasion when he would have had so many of Foster’s to choose from. I know from Foster himself that Moore often got shirts made privately with him aside from those which were produced and retained from his movie roles and that these private orders often happened on foot of a win gambling which Moore apparently liked to do. I think it was through this pass time that he came to meet Saltzman and Broccoli in the first place. Dan, I understand where you’re coming from and for me, I often associate them with Peter Seller’s Inspector Clouseau character (not an image Bond would be seeking to cultivate!) but nevertheless they – particularly a classic one like this – are very British. Yeah, I concur with your thoughts regarding Moore’s shirting here. While we have no clue where these shirts were sourced/acquired they do seem to be of lesser quality. These remind me of something found at a mid-market department store like Von Maur or Macy’s. However, with that being said, Roger has enough panache to make a ready-to-wear shirt look up to code. I would argue though that even department store stuff can look richer than it really is with proper fit, a good eye for style, and confidence. I believe that was the point I was driving at. Roger has such impeccable style and good taste that aside from the tell-tell signs of RTW clothing, you really wouldn’t have known they weren’t tailor made. For some reason if I picture Bond – both the literary and cinematic versions – in any kind of rainwear it would be navy, charcoal or black. Nothing seems to indicate said raincoat’s colour, but the temptation to imagine it as a tan trench coat is very strong. You’re right that tan would be assumed, but Burberry’s also made navy. Of course; however the original colour for trench coats was khaki. Otherwise, the other colours would certainly suit the literary Bond’s darker side. There’s no fine line between tan and khaki. The kind of coat he wears in the CR movie seems up the alley of literary Bond. Dark, minimalist, no double breasted closure or belt to fiddle with. There’s a belt but he wears the raincoat open and thus leaves the belt unattached. 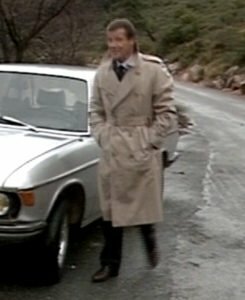 I think this raincoat looked great, especially in navy (I seem to recall that it was a navy herringbone but I am not sure).